You rarely ever think about it, but the styling of your backpack is as noticeable as your choice of shoes. It's easy to forget since we see this item as more as an educational necessity than as an extension of our tastes, but is there anything else we wear more on a daily basis besides a backpack? We should pay ode to its function and utility that we use for our books- or just a laptop in my case (who buys books past freshman year?) - by using one that aligns to our tastes. I see a lot of guys on campus with a North Face or Under Armour bag. This is a fairly recent trend, probably starting around the time neo-prep fleece jackets or Ugg Boots started to get popular. I think the standard black NF pack is all too common these days, and a young trad can go a step farther and stick with something more tried and proven. Enter the Jansport Right Pack, weighing down students for almost three decades. Why do I recommend this boring looking pack? Because it flies in the face of all of the current styling of today. It is extremely basic, made in a time where there were no need for cell phone and iPod pockets. No flashy and athletic material since you should'nt store your cleats right next to your English essay. And no extra outdoorsey bells and whistles, because your accompanying Mountain Hardwear technical jacket and Fratagonia beanie have never actually seen a hiking trail. I have a lasting impression of the Right Pack. One cold and rainy Autumn night during my freshman year, I was walking to my evening class when I noticed a graduate student with a bright green rainjacket, OCBD, chinos, Topsiders, and a navy Right Pack. 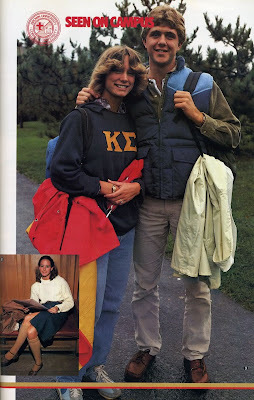 My campus at the time was not a very preppy one at all and I was still a novice at my own trad style, so this was a great scene to me. The description may sound bland, but the details all came together as an eloquently put-together outfit, and I use that image as an inspiration years later. Another romantic image I have of the Right Pack is as an important piece to the "Harvard Boy" look, as described in my Pea Coat article (where I of course, also mentioned the backpack). A grungy, Dawson's Creek- 90s era, a Hopkins medical resident walking in the emergency room and preparing for a long night, taking off his Pea Coat and Orioles cap to reveal his scrubs underneath, and a red Right Pack, bruised and battered from years of undergrad and med school studies, still serving its owner well into his future career. This also may have been a scene in ER during the Clooney days. Taken from Harris Tweed Jacket's old blog, these two pictures are from an old Japanese article (we thank our Far East brothers for being the saviors of Trad, i.e. 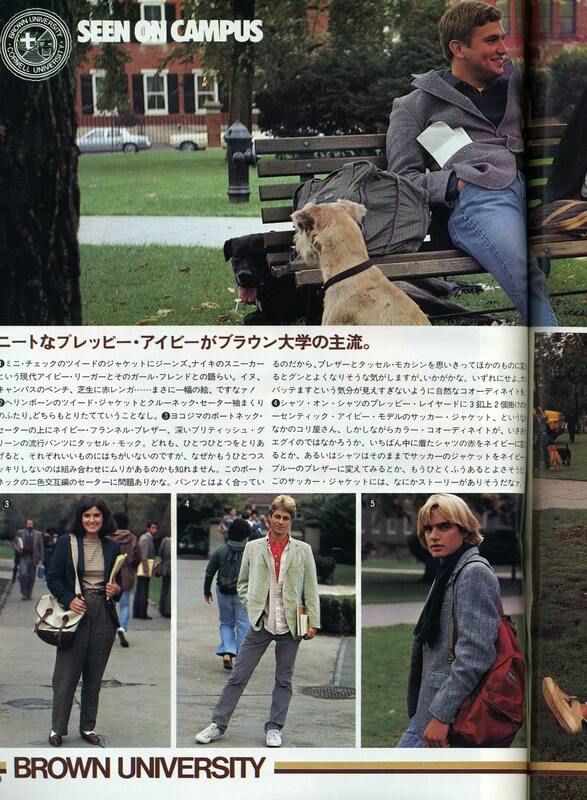 Take Ivy) with pictures taken at ivy league schools in the 1980s. You can see a red Right Pack below. Worn loose and on one shoulder, you can stick your Barbour Bedale between the straps. 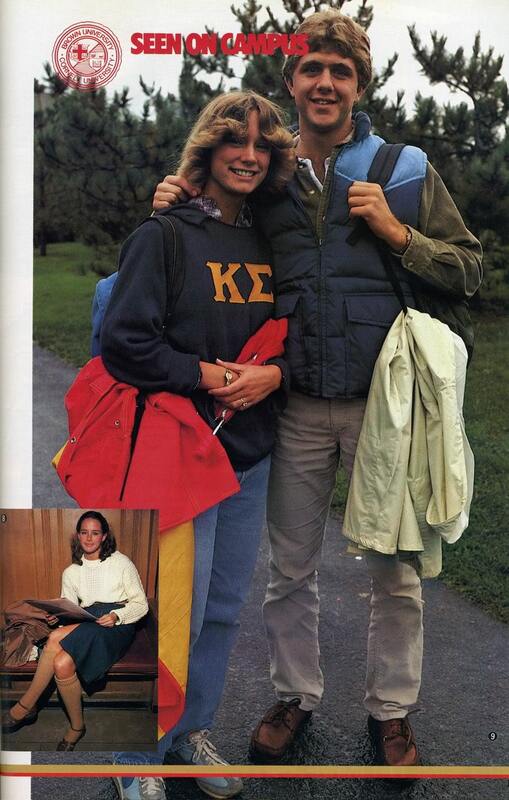 Your other arm should be around a sorority sister, maybe this couple's daughter. There are some downsides to the Right Pack. As stated, it does not have many superfluous pockets, which actually do come in handy for all of today's technological comforts. No place to put a water bottle either. Still, like with all tradly things, its a pack you can wear without looking dated in a few decades from now. You can look like a poser in a North Face, or like the guys above in their Right Packs. Updated alternatives that I like that are equally as preppy to the Right Pack include the LL Bean Deluxe Book Pack (but leave the initials for the girls) and the Kegger from the JanSport Heritage Series. The leather markings on the Kegger pay homage to some of their earlier models that used leather similiarly to the Right Pack's leather bottom in order to delay wear and tear. Seems like all the best stuff was made before the age of man-made material. There are some neo-prep stuff that I like, such as Kelty backpacks, but unless you do climb mountains regularly you should try to keep the amount of tech down (no, "hikes" across campus don't count). The extra straps and material make packs too cumbersome and heavy and don't serve a purpose for your walks in between class. Or just have seperate bags for your books and your outdoor hobbies. 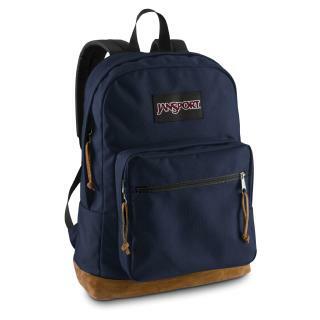 The Right Pack is offered in many colors, but I like classics Navy and Red the best. Just discovered your blog today. It's nice to hear the perspective of another blogger around my age who has such an interesting take on things. Keep up the good work. I've added you to my blog roll over at the CKC. Damn, my LL Bean sportsman's ruck sac is definitely monogrammed... on my campus though, its like 8 to 10 LL Bean bags to anything else, I guess its partially because we are only like 4 hours away from Maine, I feel like Bean boots and mocs are very popular here compared to other locations. Thanks CKC, will visit your blog as well! @Dex, I saw a lot of Bean bags in middle and high school, now its more North Face and the like. Bean boots are rare in my area though. Sperrys galore.